The Black Panther (1977) is an intelligent true-crime drama that charts the infamous killing spree which Donald Neilson, aka the Black Panther, carried out across England in the mid-70s, culminating in the kidnapping and murder of a 17-year old girl. Newly mastered from original film elements preserved in the BFI National Archive, this impressive and powerful film is at long last being made available for new audiences in a Dual Format Edition for a May release by BFI Flipside. Told with uncommon accuracy and refraining from any measure of sensationalism, director Ian Merrick and screenwriter Michael Armstrong's fascinating and disturbing film fell foul of a media-driven campaign upon its original cinema release in 1977, which resulted in an effective ban. Established lead actor Donald Sumpter, who fearlessly played Donald Neilson, was recently seen in The Girl with the Dragon Tattoo (2011). Marjorie Yates who played Neilson's wife is perhaps best-known for her role as Carol Fisher in the Channel 4 TV drama Shameless. Debbie Farrington (who plays the kidnap victim) went on to appear in a variety of TV dramas. Caught by chance after a random encounter with the police, Neilson was convicted in 1976. With five life sentences he was destined to spend the rest of his life in prison and died there in December 2011. 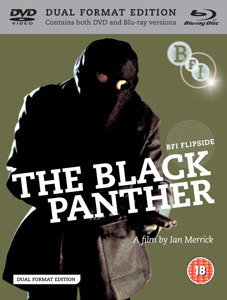 The Black Panther will be released as a dual format edition (DVD and Blu-ray discs together) by the BFI as part of their Flipside strand on 28th May 2012 at the RRP of £19.99. Illustrated booklet with newly commissioned essays and contributions from Ian Merrick, Michael Armstrong, Bob Bentley and James Oliver; original promotional artwork and full credits.